Continental style rods have become increasingly popular in UK and equally Century’s UK styled longer rods are now migrating to European shores. Century has gained very useful experience in this field with the legendary Danny Moeskops inspired Carbon Metal BB. Century is carrying forward this concept and heritage with the feature rich Eliminator T700, taking advantage of the success anglers have experienced with the Eliminator programme and our Graphene technology. Modern composite materials and advances in manufacture techniques are now capable of delivering lightweight, robust and tactical rods where improved casting distance can be achieved with overhead casting styles. The increasing use of braided line and fixed spool reels offers simplicity of use and when coupled with tip sensitivity – distance and more productive results are much easier to achieve. 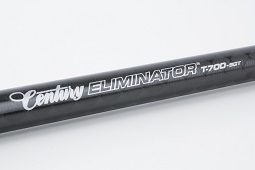 The Eliminator T700 is designed for clean, sandy and snag free venues with the option of excursions into mixed ground. It is a highly competent match rod. The testing and development has been undertaken thoroughly, employing overhead casting and off the ground styles. In managing expectations – we suggest you avoid high energy pendulum or extreme power casting styles. We have many other World Record holding rods in our ranges that are masters of ultra-powerful casting styles and heavier ground angling (Eliminators T1200, T1000, Excalibur TT, TT-R and Kompressor WR300 to name a few). The nature of the T700 design and the carbon fibre ply architecture is geared towards Continental styles of casting – primarily with fixed spool reels – with a constant and progressive build up using the individualised lever action of this rod. The new technology used in the construction of the blank is highly innovative and we utilise Generation 2 Anti-Twist Technology (AT-T) in the tip section that radically improves directional stability and thus improving accuracy, reducing line fraps and delivering distance. All rods have a “moment of inertia” and this is pronounced in lightweight longer rods that can tend to twist when cast. The Generation 2 AT-T resists this angular acceleration by the insertion of fibres at varying angles within the wall of the rod. Century’s proprietary method of achieving this without losing tip sensitivity and keeping the weight low in the tip, stabilises the rod, maintaining alignment of the guides during compression of the rod when casting. The Eliminator T700 also incorporates the revolutionary material called Graphene in the resin matrix, binding the carbon fibre together. We have used this material in various high-performance rods and have demonstrated considerable benefits in tensile strength and improved toughness for comparably lighter blank weights. What is Century Graphene Reinforced Technology? Century has developed a bespoke combination of the resin matrix and Graphene. 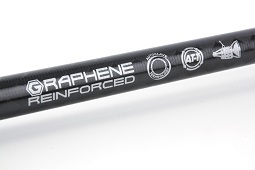 The resin matrix carries the loadings between the fibres – generated in the rod when casting and playing. Graphene creates additional resilience and toughness. Graphene is a form of carbon in a monolayer of honeycomb lattice and its discovery was awarded the Nobel Prize in Physics. When properly incorporated in the resin system it has the capacity to significantly increase resilience far more effectively than one-dimensional (e.g. nanotube) and zero-dimensional (e.g. nanoparticle) fortifiers, enabling us to make rods lighter with high strength and the toughness you expect of a Century rod. Remarkably light at 15ft for a conventional beach caster. The recovery is very smooth but crisp. 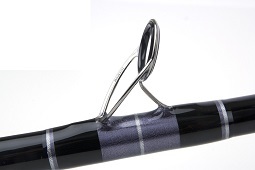 This rod is unbelievably user friendly. Very easy to achieve distance with this rod. I’d like to think most anglers should comfortably achieve good distances with bait with little more than an easy overhead thump. Very easy to load the rod but also feels comfortable with a variety weights. I have gone as low as 60 grams and up to as much as 200 grams and the rod copes very well. The SGT bite detection is next level. 5 ¾" 7" 7 &frac38;" 10 ½" 11 ½" 14" 17" 10"